Keep prized jewelry pieces on display with Tracy Shea's handmade stand. Delicately detailed like a wedding dress, but sturdy enough to hold your prized jewelry pieces. That's the beauty of this pedestal. 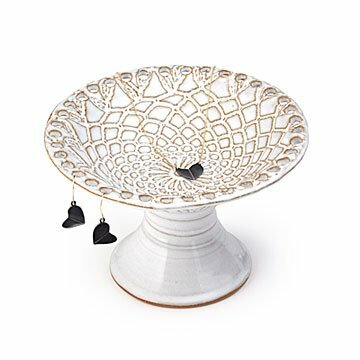 Tracy Shea handcrafts the design from stoneware, pressing the top of each with vintage lace. She then adds a matching lacy white glaze. Dangle up to 20 pairs of earrings around the edges, then place your favorite bracelets or baubles in the center dish. Give one to the friend whose collection deserves an elegant display. Handmade in Ohio. "I fell in love with clay immediately," says potter Tracy Shea, "and this memory is part of what motivates my love of teaching people of all ages about such a magical medium." She is inspired by form and function, the beauty of nature, and intimate gatherings of family and friends. "I appreciate the opportunity to make special, useful pottery that inspires beauty at home, and service and celebration at the table every day." This one is simple, but has personality without clashing with my other bedroom decor. There are also enough places to add lots of earrings and unlike a screen option, it's easy to hang the earrings.